XTEM, HRTEM or STEM samples of the best possible quality. These ion mills are also suitable for quick thinning of dimpled or thin (< 25 μm), planar, mechanically polished samples. TOP-OF-THE-ART LOW-ENERGY ION SOURCE The Gentle Mill ion beam workstations operate with an outstanding patented hot-cathode low-energy ion source. The extremely low energy of the ion beam guarantees minimization of surface damage and ion beam induced amorphization. The exceptional construction of the ion source allows high ion beam current densities. All ion gun parameters including accelerating voltage and cathode current are controlled automatically by a digital feedback loop, but they can always be changed manually during the sample preparation procedure. The initial values of the ion source parameters are set either automatically or manually and are continuously displayed on the computer screen. The Gentle Mill’s exclusive capability of producing damage-free samples at low-energy ion bombardment provides unique opportunity to study the real nanostructures in synthesized and natural materials in all fields of technical sciences and materials research. The third generation Gentle Mill 3 models are provided with full computer control utilizing an easy-to-use graphical interface. All milling parameters including ion source setup, gas flow control, setting of other milling parameters such as sample motion and tilt angle, perforation detection can be stored or pre-programmed in arbitrary number of steps. This fully automated feature allows to produce high-quality samples with minimum user intervention. Gentle Mill 3 is supplied with a software extension for in-line support, which enables instant error detection and problem elimination via the Internet. Hitachi and Technoorg offer a complete solution for site-specific and low-damage specimen preparation based on Hitachi’s FIB/STEM systems and Technoorg’s Gentle Mill ion beam workstations. The low-energy ion milling and cleaning capability of semi and fully automated Gentle Mill models is used in the final stage of FIB specimen preparation to remove the amorphized or otherwise damaged surface layers. 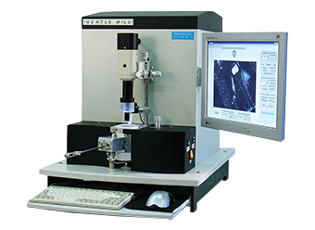 These models allow direct insertion of Hitachi’s 3D FIB/STEM sample holders, thus the sample preparation time can drastically be decreased.